Changing lives through the power of the creative arts. In March 2018, we changed the name from "Playing For Good" to "TammiFest" in memory of Tammi Hendrix. She was kind, a talented artist, an entrepreneur, and the beloved sister of Terri Hendrix. This amazing art guitar by local artist Jill Holechek was auctioned off and $250.00 in proceeds were then given to the Mermaid Society of San Marcos, Texas. Proceeds from this beautiful art guitar made by John Moore went towards the 2017 Arts & Humanities Scholarship given to Ron and Marie Jager. The OYOU then made a $650 donation in their honor to the Price Senior Center in San Marcos. We Shall Overcome volume knob. It sounds kinda like a banjo! 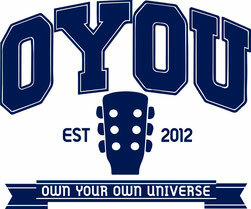 The OYOU's 1st annual art and music festival! Uniting the community!